Southern Tier | Beer Apprentice - Craft Beer News, Reviews, Interviews and Info. Hello everyone. For today’s craft beer review I’m going to be trying the Southern Tier Back*Burner produced by the Southern Tier Brewing Company located in Lakewood, New York. It might be a bit warm outside for a big, bold Barleywine, but what the heck, I’m going to try this one anyway. From the website, southerntierbrewing.com, we find this description of the Back*Burner. Long ago, British farmhouse brewers made special ales using the first runnings of the mash. These beers, now called barley wine, are brewed in the tradition of days past. Our first brew of the year, this ale is conceived in three small batches with voluminous amounts of barley and hops. A lightly sweet and warming ale, reminiscent of dried fruit and rich grains. Our barley wine style ale is a tribute to days remembered, and a celebration of things to come. We hope that sipping this rare brew leaves you feeling gracious for another trip around the sun. This beer comes in a 22 oz. bottle and it has an ABV of 9.6%. It poured a deep burgundy color. Almost a grape color to be honest. The head was off white, smooth, slightly creamy and very nicely sized. The retention time was decent and the lacing was ok as well. A very noticeable amount of clear alcohol legs adhered to the sides of the snifter also. The nose brought forth a solid bit of rich, dark fruit. Mostly raisins, grapes and dark cherries I thought. A sturdy amount of caramel malt sweetness was noticed too. Some piny and earthy hops helped balance and tie everything together. An admirable and commendable fragrance with this one. The taste seemed to let the raisins, grapes and the very sweet caramel malt dominate. Man, it was rich!!! Almost too much for my liking. After it warmed a bit, some breadiness helped calm it down a touch, but not much however. The earthy and piny hops that were discovered in the nose were nowhere to be found in the taste. Maybe the slight bit of age on this beer pushed them to the side. Whatever it may have been, I was a bit overcome with the strong sweetness and dark fruits. The mouthfeel was medium bodied. Very smooth, dry and chewy. As was to be expected the carbonation was a smidgen on the low side. A good deal of warmth was felt and a favorable amount of flavor was left covering the palate after each sip had passed on into my belly. Well, this beer was pretty good I guess. I was a little bit confused with the overabundance of richness that it possessed however. That made the brew a little bit tough to drink for me. Especially since it had such a pleasurable amount of hops in the bouquet that I thought might be more prominent in the taste. Oh well, it would still be worth a try if you favor Barleywine styled beers I guess. I have another bottle of 2012 Back*Burner that I’ll hold onto for a couple of years to see if it might calm down a notch or two. 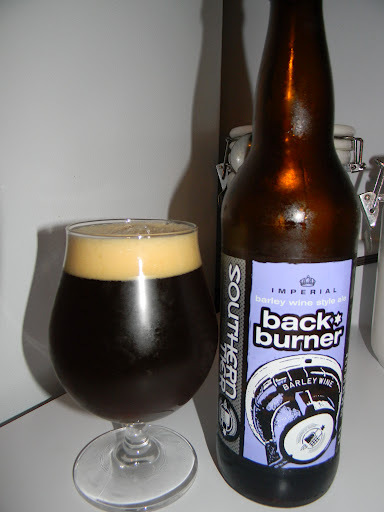 Have any of you guys every tried the Southern Tier Back*Burner and had a similar experience or was it just me? I would love to hear a second opinion. Feel free to leave a comment if you wish. Hi guys. For today’s craft beer review I’m going to be sipping on the Southern Tier Choklat produced by the Southern Tier Brewing Company located in Lakewood, New York. No need for small talk when it comes to Southern Tier. We all know that they make great beer. From the website, southerntierbrewing.com, we find this description of the Choklat. The Popol Vuh, the sacred book of the Maya, unfolds a complex web of mystery around a beverage known as xocoatl (ch-co-atle). At Southern Tier, we’re not surprised that hieroglyphs of the ancient Maya depict chocolate being poured for rulers and gods. Even through the many voyages of Columbus, the mystical bean remained nothing more than a strange currency of the native peoples. Moving through centuries, the circular journey of cacao has been realized in our brew house, encompassing the complexity of the darkest, bittersweet candy together with the original frothy cold beverage of the ancient Maya to bring to you our Blackwater Series Choklat Stout. We have combined the finest ingredients to tempt your senses and renew the power and interrelation of history in every bottle. Let’s take a drink or two shall we? This brew comes in a 22 oz. bottle with an ABV of 10.0%. From a very easy pour this beer had a very dark brown to black color with absolutely no highlights showing through at all. The head was tan in color with a very smooth, creamy and soft texture. The size was about a finger and a half with an excellent retention time and real nice lacing. Once the head settled it left a decent ring around the top of the liquid, which allowed for some beautiful alcohol legs to be seen when tilted from side to side. The nose was….. well…. chocolate. Exquisite hints of chocolate milk and cocoa. It literally smelled like a liquid Hershey’s Milk Chocolate bar. I did pick up on tiny bit of hops and roasted grain, but not much really. The chocolate was, obviously, the star of the show….. and I loved it. A beautiful smelling beer right here. The taste was more of the same. Chocolate, chocolate and more chocolate. The hops added a decent touch of bitterness while tones of grain and roasted barley kept it from being too one dimensional. It’s sweet, but not near what one would think. It’s very soothing and enjoyable without being overly rich in my opinion. Don’t get me wrong, it was big and robust, however easily bearable. Just a touch of alcohol started to become noticeable after the brew warmed somewhat. Again, just an added characteristic that never overtook the chocolate. The mouthfeel was medium to full bodied. Smooth, chewy, thick, creamy and sticky. The carbonation was about right for a beer of this type and more than enough flavor was left behind after each sip. A slight burn of alcohol was felt with the first few sips, however my palate quickly adjusted and it became much less noticeable. Well, If you have followed this blog for awhile you are well aware of the fact that I love Chocolate Stouts, and folks…… this is a world class Chocolate Stout!!! It has to be one of the best that’s produced. I know I haven’t tried all that’s available, so I could be missing one or two, but this brew was a treat to drink to say the least. For me, it ranks right up there with the Rogue Chocolate Stout (which is one of my all-time favorites). 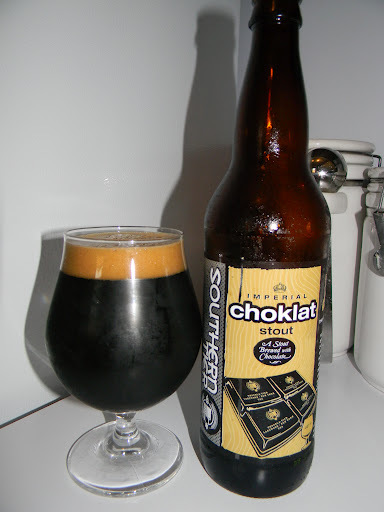 If for some reason you have not tried the Southern Tier Choklat, I would highly recommend it. It may be too much for some and the drinkability factor is a touch low, but if you are looking for dessert in a bottle, this beer is it. It’s probably best suited for cooler weather, but I could definitely see myself enjoying this with some vanilla ice cream during the Summer months. Have you guys ever tried the Southern Tier Choklat? What did you think of it? Be sure to let me know your opinion. Hello everyone. I hope all is well. For today’s craft beer review I’m going to be trying the “Oak Aged” Un*earthly produced by the Southern Tier Brewing Company located in Lakewood, New York. I’ve had the regular Un*earthly a few times, however I’ve never had the “Oak Aged” version. I’m really excited about giving it a go. From the website, southerntierbrewing.com, we find this description of the beer. To underestimate Oak Aged Unearthly is to trifle with the mysteries of the universe. Here, we take our unparalleled Unearthly IPA and age it with oak for a harmonious fusion of rich malts, grassy hops, and savory oak. An unearthly union, indeed. Particularly tasty when paired with sharp bleu cheese, fresh-baked sourdough bread, curry, very sweet & rich desserts. This brew has an ABV of 9.9% and it comes in a 22 oz. bomber. It poured a cloudy, deep orange to caramel color. The head was off white and voluptuous. Very creamy, smooth and rocky. The retention time was excellent and the lacing was thick and clingy. I must say that it looked really, really nice standing in the tulip glass. The aroma was very sweet. Heavy caramel notes along with a plethora of orange citrus. I definitely got some of that oak and wood, which in turn, presented a light dose of vanilla. It was quit resinous, piny and floral. As the brew warmed a touch, a hint of Bourbon and more wood became noticeable. This beer has an aroma very similar to an American Barleywine. Overall, a very “big” and robust nose….. and I like it!!! The taste brought forth a touch more of that Bourbon/wood flavoring than was found in the bouquet. Again, strong, sweet caramel malt and bitter resinous hops of pine and orange citrus. The vanilla was more of a player in the taste as well. Just a smidgen of breadiness was found through the middle, but the primary characteristics were the hops and the alcohol. Once more, very nice and tasty. The mouthfeel was medium to full bodied. Very smooth, dry, sticky, slick, thick, chewy and filling. The carbonation was of medium strength. A bit of warmth was felt at the back end and a healthy shot of flavor was left behind on the palate after each sip. I tell ya. We have a real nice beer here. It’s got a lot going on that’s for sure. Very complex, but harmonized extremely well. The drinkability was fairly good and it more than holds up in all of the other major categories. Let’s face it. Southern Tier just knows how to make good stuff. I would recommend picking it up if you can. I do like the Oak Aged version a wee bit better than the standard Un*earthly, but both are solid and worthwhile beers that wouldn’t disappoint no matter which you chose. Which do you guys like the best? Be sure to leave a comment and let me know.